This proud couple are Mum and Dad to Aisha (nearly 4) and August (nearly 2). Together, they work at Ezypay, which is a direct debit company that helps businesses in Australia and New Zealand collect ongoing payments from customers. 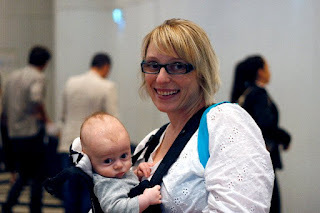 “The hardest transition for me was going on maternity leave in the beginning. Being a Mum is so overwhelming, new, stressful, joyous, sleep deprived and unknown experience. I wanted to be with my baby desperately but I was also yearning to go back to the semi controlled day to day of work where I was experienced and kind of knew what to expect”. Plan dinners and food for the week. Write a list and shop once a week. Both our kids go to family day care so we need to pack their lunches. We do as much of this as possible on Sunday night. Trent takes them to care and I pick them up so I try and get to work early and he stays back a bit later. I go to bed early cause I generally get a 5am – 6am wake up call. When we get home I generally start dinner and when Trent gets home later he gives the kids a bath. We sit down as a family and have dinner together between 6.30pm – 7pm most nights. We enjoy it, are very busy and we wouldn’t have it any other way.